BWP and BWR are two different grades used for waterproof plywood. Many dealers and retailers often used these two terms together to confuse buyers. Let me clear this confusion for all buyers and especially Home owners who are the victims most of the times. Firstly let me explain what these terms stand for, BWR denotes boiling water resistant grade plywood. While BWP stands for boiling water proof grade plywood. Well technically there’s very small difference with regards to technology and treatment used to manufacture each of these plywood. The glue used to manufacture each of these is synthetic plastic resin i.e. 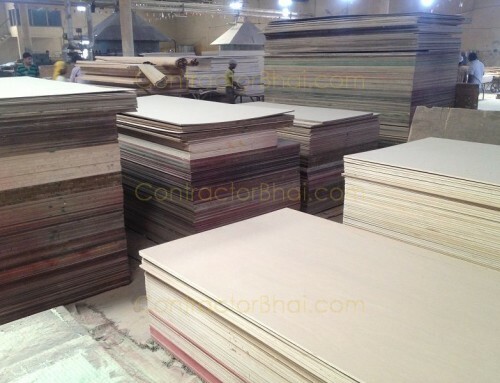 phenol formaldehyde which is said to be better than urea formaldehyde resin used to make MR grade commercial plywood. To simplify, BWP and BWR are plywood standards. These standards are set by government. 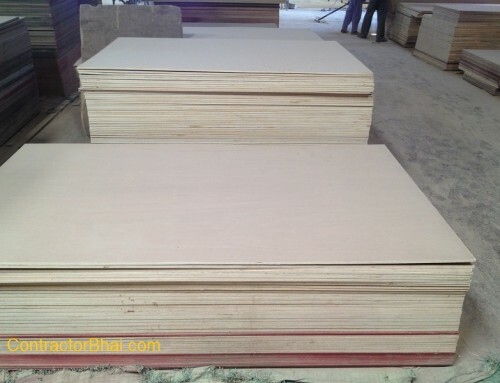 For factories manufacturing plywood, they need to meet assured quality, tests. Also the process of manufacturing too is customary. And therefore you have set standards for each BWP and BWR grade plywood. BWR plywood can also be made in Garjan wood, which is an imported wood. You also have BWR grade plywood made from poplar Indian species wood. In Industry, BWR grading is used to grade plywood while BWP grade is used to mark block-boards or ply-boards. 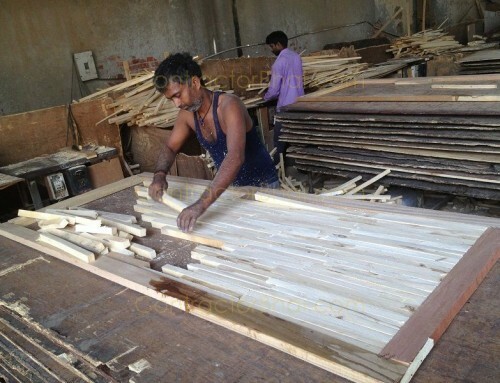 Many enquire for the raw material used to manufacture plywood. But truly that doesn’t really make much of a difference. Also May home owners enquire for BWP as marine ply or waterproof ply. Well waterproof ply can be made from Garjan wood and other popular Indian species wood too. 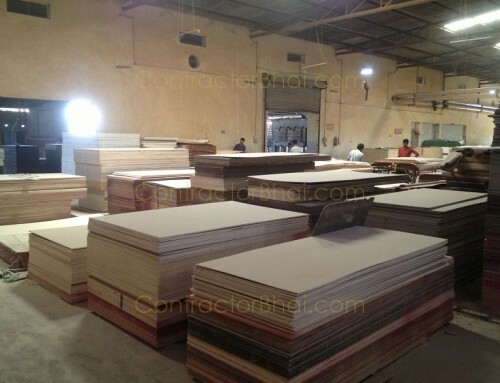 Which material is used for making plywood is a different in-depth topic altogether. Let’s not get into those details for now. Here we are talking about BWR and BWP and these have set standards. For e.g for BWP plywood, has to pass 72 hour boiling water test. The glue used, pressing technique and pressure used for BWP is different then for a BWR plywood. With technology and science there are various types of plywood easily available in market today. Home owners often get confused which is the best to buy to make a product.Home owners are often confused between BWR and BWP waterproof plywood. As I said earlier technically BWR grade is used for grade waterproof plywood and BWP is sued to grade waterproof block-boards. But BWR is a lower grade than BWP. Many dealers and retailers handover BWR grade plywood as BWP grade, especially to those who fail to distinguish between two types of plywood. What happens is home owners end up buying a lower quality plywood then required. I therefore suggest every home owner to always look for the mark “BWR” and “ BWP” on plywood before buying it. 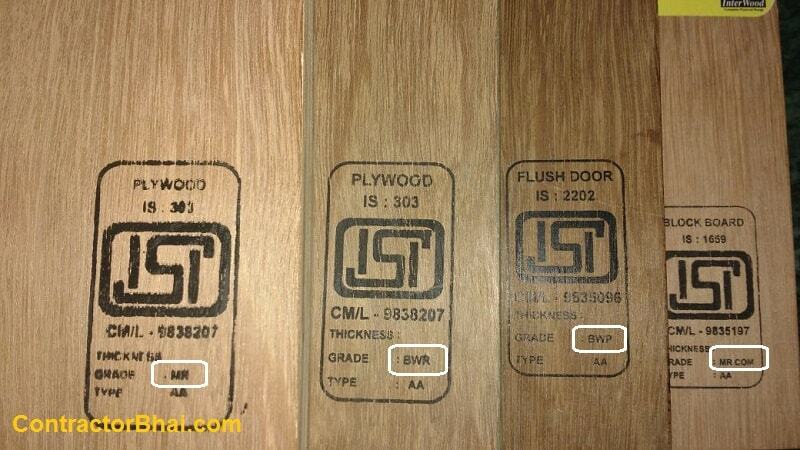 Branded plywood will always have the grade of plywood mentioned on it. If the board is marked as BWR, it mean it is waterproof exterior grade plywood and if its BWP grade, it is an exterior grade waterproof blockboard. Well Costwise too, there’s 10% to 20% difference. BWP is costlier than BWR wood. BWP grade plywood is widely used to make furniture where water contact is expected. For home interiors BWP is the most preferred plywood. Hi ContractorBhai.. Do you have any branches in Hyderbad? we have done several projects in Hyderabad. Pls call 9920620009 for details. Contractor Bhai pls suggest us which ply company is good for interior for my newly constructed home, work like kitchen, wardrobe, bed & TV unit etc..
For kitchen & bathroom use waterproof ply. For rest of the house use commercial ply ( Alternate or Hardwood). Hi, do you have any branch in Pune? I’m constructing new shop , My architect is saying BWR is the best for interior . Can you suggest me which will be good BWR OR BWP? BWR is sufficient for shop, ony area where there will be lot of water you may use BWP. BWR is sufficient. 1. Do you provide your services in Bangalore? 2. Is there an ISI grade for laminates also? If so, can you suggest which grade laminate for Kitchen and wardrobes? Which grade plywood can be used for TV and wardrobes? We have designed many Bangalore homes. Every material has an official ISI grade/number. Any good quality laminate is good for all home furniture. Kitchen & Bathroom always use Waterproof plywood, rest can be commercial plywood. Hi, please can you suggest if i can go for commercial ply in Kitchen as my sink area is in the utility area ? Indian kitchen conditions are such that you end using lot of water for cleaning cooking etc. Even though sink is away, water will regularly get in touch with shutters etc. Waterproof plywood is recommended for long lasting results. If you are doing work keeping timeframe of 15 or more years then waterproof ply inside kitchen is advisable. 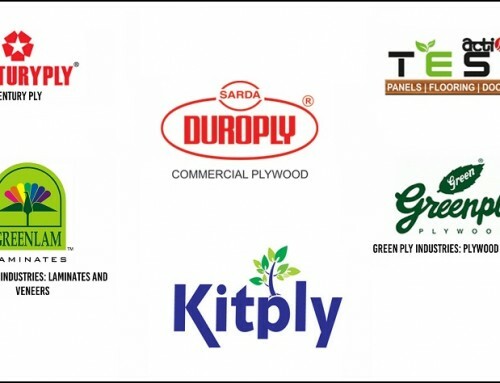 Hi, please suggest if I put commercial plywood in Kitchen then whether ply would be damaged if ply gets in touch with water or water is fallen down in the Ply. commercial ply has less resistance for water/moisture. Usual Indian kitchen usage involves lot of water for cleaning etc. Hence water proof always recommened in kitchen for long term results. Lot of people use commercial since it is covered by laminate from all sides. Hwoever if you are considering long term results 15-20 years of no maintenance/repairs then waterproof is required.